I was looking through my posts the other night and discovered that it's been awhile since I last featured a nail polish I love. I'm such a polish addict, how could this be? 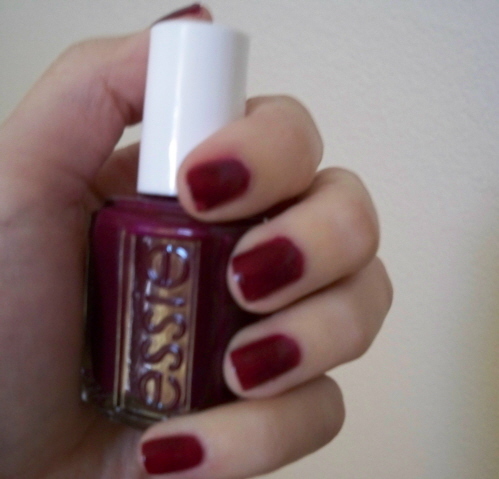 For my friend's wedding, I decided on an old-standby: Essie's Bahama Mama. It is a beautiful creamy wine color. Nothing too incredibly unique, but this is definitely a prime example of "good Essie." 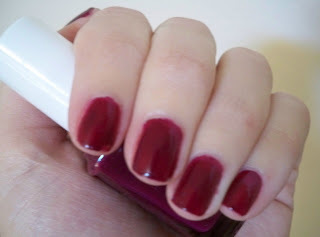 Two opaque coats is all you need to achieve a beautiful crimson look. In fact, nine times out of ten Bahama Mama was on my toes last Fall and Winter. On the rare occasion I got a salon pedicure, I still was sure to bring my own bottle with me for the nail tech to apply. I have Bahama Mama to blame for my Essie obsession because it was one of the first polishes I ever purchased from the brand. I wish all of their colors could be this easy to work with! I highly recommend this particular shade. On another note, I was ﻿super excited and humbled when Andi of Saltwater Dreams asked me to do a guest post for her. She asked some of her fellow bloggers to write about their Holiday wish lists to be featured on her blog for the month of November while she participates in National Novel Writing Month. I love her blog as well as her writing and I wish her all the best! Natali and ifoundpablo: Check it out if you have a chance ;) I'm still wearing it on my nails and I know it will once again become my most worn polish. The colour looks gorge on your skin, its such a lovely colour. I wore it for the first time 2 weeks ago but I forgot to take a pic lol but I really liked the colour and it was much easier to apply than other colours from Essie. I love the richness of that red. What a great fall color! Henessy: Good, I'm happy you like it too! Katie: Don't worry, I'm changing mine. I think to deep purple, almost black! So pretty!! Im looking for a shade to replace my bottle of Chanel vamp, is it more wine than red? ?/ I hope so...I think this may be my holiday shade. LOVE that color! Red is my fav nail color. Nina: It is definitely a wine color Nina. I know my camera picked it up as being a little lighter than it actually is. I think you would love it!